The U.S.S. Enterprise studio model from TOS Star Trek: The Original Series, which has been on public display at the Smithsonian’s National Air and Space Museum since 1976, was removed on September 11 from the lower level of the museum's store -- where it's been ensconced since 2000 -- in order to prepare it for its new display location in the Boeing Milestones of Flight Hall, set to open in July 2016, in time for Trek's 50th anniversary. The current main hall at the National Air and Space Museum, Milestones of Flight, has on display such icons of spaceflight and aviation history as the Wright Brothers’ plane, the 1903 Wright Flyer and Charles Lindbergh’s Spirit of St. Louis. Visitors there can also see John Glenn’s Mercury capsule, Friendship 7. Milestones of Flight will be the beneficiary of a full renovation and expansion, courtesy of a $30 million donation from the Boeing Company, and will be renamed the Boeing Milestones of Flight Hall. Further, according to the National Air and Space Museum, the overhaul will take into account its revised definition of the word "milestone." Where once "milestone" meant "the first" in space travel or flight, it will now embrace "an artifact having significant or widespread cultural, historic, scientific or technological impact." I for one am looking forward to the old girl's unveiling in 2016. Field trip anyone? The model, which arrived damaged and in pieces, was initially hung as part of a “Life in the Universe” exhibit in the Smithsonian’s Arts & Industries Building. The National Air and Space Museum, where the Enterprise has spent the 21st century thus far on display in a custom case in the basement of the gift shop, wouldn’t open for another two years. Once NASM opened, the Enterprise spent most of the years between 1976 and 1999 suspended from the ceiling. As Margaret Weitekamp, curator of the Museum’s Social and Cultural Dimensions of Spaceflight Collection, explained to an audience of Trek loyalists at a public lecture last night, the model was initially regarded more as a piece of decor than as an object deserving of preservation and scholarship in its own right. That distinction influenced the approach taken during its most recent restoration, in 1991, which included a new paint job and detailing intended to help the model live up to the memories many visitors have of the starship they originally saw on tiny, primitive TV screens. This is different from trying to make the model look as authentic as possible, or closest to its condition when used in filming the TV show. The fan community has been critical of these efforts to improve the model’s appearance, Weitekamp said—and she sympathizes with their greivance. 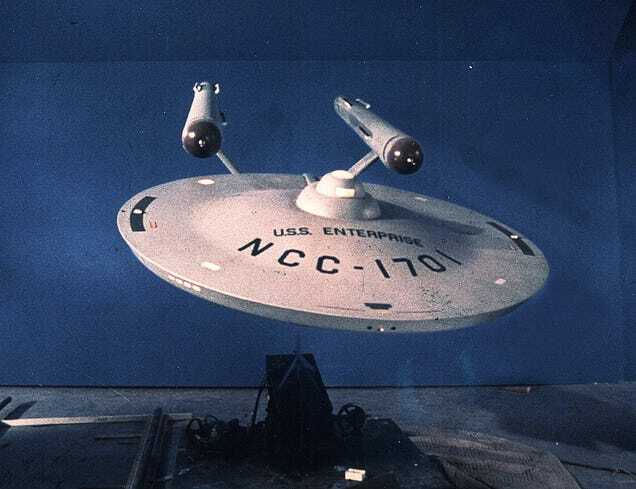 Regardless of whether the Enterprise is more important as a symbol or as a tangible object, one thing is certain: The model was a TV prop built as cheaply as possible almost half a century ago. It was never intended to be hung, and a series of X-rays taken in 1999 revealed stress fractures in the wood. The model has been displayed on a stand, as originally designed, since then. Though it’s been restored three times already during its stay at the Smithsonian, it’s in need of a major overhaul to return it to something like its original status on the Starfleet duty roster, and that’s finally about to happen. After 13 years in the gift shop, NASM has removed the model from public view for restoration at the Museum’s Steven F. Udvar-Hazy center near Dulles International Airport in Virginia. The restoration is expected to take roughly 18 months. 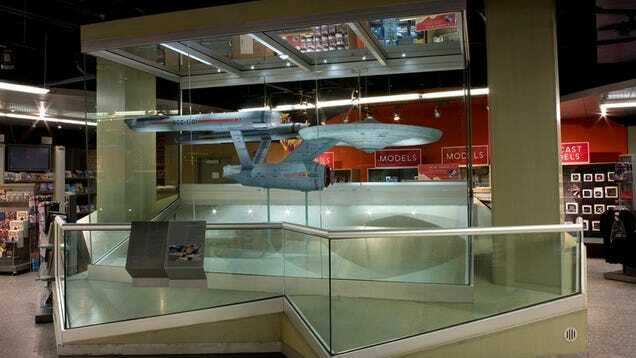 When the Enterprise returns to the National Mall, it will at last be given a spot on the downtown Museum’s ground floor. It's new home will be in the Boeing Milestones of Flight Hall, which will remain open to the public as it is refurbished in preparation for NASM’s 40th anniversary celebrations in 2016.